The illustrations in this book are stunning. Junzo Terada is the celebrated artist behind them. They are full of retro-gorgeous colors like real red, a soft blue, yellows, and greens and browns. The images are slightly splotched (that’s a terrible description from someone who is obviously NOT an artist) with patches of white and gold, making them even appear old. The story is a little bit retro, too. It’s a toy store story. And a forgotten toy, kind of like Corduroy. Tabi the mouse cleans the store at night and loves Max more than anything, but tried to make the very serious dog with a somewhat unhappy face more likable so he will get taken home, too. The story is simple and predictable with a happy ending, which is pleasantly old-fashioned. Don’t get me wrong, I love all the new things going on in picture books these days, but sometimes you don’t feel like a zombie robot or a creepy carrot or using all your energy mixing pretend paints. Sometimes you just want a nice story. With nice characters. And undescribably nice–beautiful, too, and poignant–illustrations. I think the title of this book Robot Burb Head Smartypants, pretty much says all you need to know. Our favorite robots from the totally awesome Robot Zombie Frankenstein book by Annette Simon are back. Only this time they are trying to teach you things. Like counting. And saying the alphabet. But, inevitably, burping gets in the way. So as you can see, there is NOTHING NOT to like about this book! It’s phenomenally awesome. Seriously. If you need more than that, I can’t help you. Well, okay, I can give you one more reason to get this book. The illustrations–digital images made of geometric shapes mixed with real photographic images–are as awesome as the text. So there. And check out Robot Zombie Frankenstein too! for kids who love colors. or those that don’t, but will soon. Mix it up! Mix it Up! uses the same principles of Press Here, but adds a whole dimension of colors and how they are made. Kids mix their fingers on the paint illustrations and make their own colors as if they were mixing paints themselves. What happens when you rub your finger on the blue then dip it in the yellow? Turn the pages to find out! What about if one page has a red dot and the opposite page has a yellow dot and you close them together? Turn the page again! What about if you mix a bunch of colors with white? Or with black? Kids will love playing with this book. And when you are done, they will love playing with paint! You could even really easily let your kids recreate this whole book with a simple supply of finger paints. How much fun would that be? remember when you played TELEPHONE? Tell Peter: There’s a giant monster lobster named Homer! He smells like socks and he breathes red fire! His eyes blaze like stars and he rides a crocodile that flies and he’s coming to this wire! Tell Peter to fly! Fly far far away! He’s too young to be somebody’s dinner! 🙂 Which made me love the book. Because really, as parents, doesn’t that just sum up the whole job? Yes, it’s nice to have fun with the kids, but sometimes, when dinner is on the table and the craziness is out of hand, it’s up to us to cut out the monsters and the crocodiles and boil everything down to the main point. That and the illustrations. Which are gorgeous. When my boys were younger, they were always ready for an adventure. It didn’t take much to stir a little excitement in them. They especially liked preparing for Halloween, which meant pumpkin picking, pumpkin carving, reading books about Halloween and of course trick or treating. Before you head out pumpkin picking, start your adventure by reading a couple of Halloween related stories. 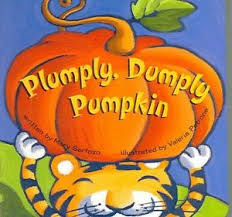 If your toddler enjoys rhyming silly stories, she will enjoy Plumply, Dumply Pumpkin by Mary Serfozo and Valeria Petrone. Peter the cat is heads to the pumpkin patch in search of a pumpkin that is not lumpy, bumpy or stumpy. Why does Peter want a pumpkin? You’ll have to read the story to find out. Peter the cat isn’t the only animal who appears in Halloween stories. Did you know that sheep trick or treat? 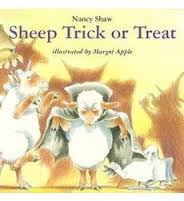 In Nancy Shaw’s book Sheep Trick or Treat, that’s exactly what happens. The sheep prepare for trick or treating by making disguises. What disguise could they possibly wear? As you read either of the above mentioned books, your child is sure to discover an adventure in the making. Add to your adventure by creating a sheep craft and a marshmallow snack. Click here for details and directions. What will your Halloween adventure consist of this year? This book made me wish it was nighttime and I was camping. Well, actually, I usually wish I was camping. But just flip through a couple of pages of this wordless, black-yet-bright, night-inspired picture book and see if you don’t find yourself waiting for the sun to go down. My kids are going to love this book. And as soon as it’s done they are going to look for their flashlights. The nighttime images are gorgeous, and the beam of light that finds bats, owls, sticks, and apples, is perfect. Even without words, the book manages to be funny. The boy trips at one point and finds the beam illuminating him–with a raccoon on the other end!